From the bright and breezy cover of this book, I thought I would be in for a pleasant, easy-reading chick-lit book. However, The Postcard has a lot more depth and serious issues than I was expecting, in a good way. Penny is a vicar’s wife and television producer who has married late in life and has a young, teething baby, Jenna. As many mothers will all too easily recognise, she is exhausted by the constant sleepless nights. As it draws near to Christmas and her husband, Simon, becomes even busier with Church preparations, Penny is finding it harder and harder to cope. With her position at work threatened and some shocking news from her estranged family, is it finally going to be too much for her? Fern Britton has painted a very convincing portrait of a mother struggling to cope with a new baby and not wanting to admit it. Most mothers I’m sure will recognise that overwhelming tiredness of early babyhood which can sometimes feel like it will never end. (I have teenagers – trust me it will!). In Penny we also see that guilt and the fear that we are not good enough mothers. Penny’s experiences with her own mother make her even more determined to be perfect for Jenna. Although I did not have post-natal depression, I feel that this is a very realistic portrayal of how it must feel. It was good to see that Penny had so many supportive friends and family to help her through such a difficult time. She certainly needed them when her sister Suzie came on the scene. It has been a long while since I disliked a character as much as I disliked Suzie! Through Penny’s childhood memories we see how the two girls were treated very differently, especially by their mother, and Suzie was clearly the favourite. In the present day, she comes across as devious and conniving and some of her actions were just awful! She may have been able to fool others but Penny could see her for what she was. At the same time, she felt this need to reconnect with her only sister and I could see why she so wanted to believe Suzie. There were some great characters throughout the book and this was not a twee stereotypical little village. There were a few more traditional characters such as grumpy Piran and wise, but gossipy shop-keeper Queenie. I also liked Ella who was returning to Pendruggan where she had spent a happy childhood with her grandmother. Hoping to discover more about her past, she quickly becomes a welcome addition to the local community. One small criticism: as I was nearing the end of the book there were a lot of quite dramatic events – I was almost reading through my fingers! – and I was wondering how the story could possibly be resolved in the few pages I could see I had left. Although the ending did resolve Penny’s story, it did so very quickly and I would have liked just a few more chapters explaining what happened in a bit more detail. Having said that, the book ended on a tantalising note with the promise of Ella’s story continuing in the next book and I’m certainly keen to read that. I really enjoyed The Postcard. It’s billed as perfect summer reading but actually half the book takes place in winter and there was plenty snow to make me feel festive! It’s a very intriguing read with lots of family secrets waiting to be discovered. Realistic scenarios, interesting characters and an idyllic setting make this an entertaining read. 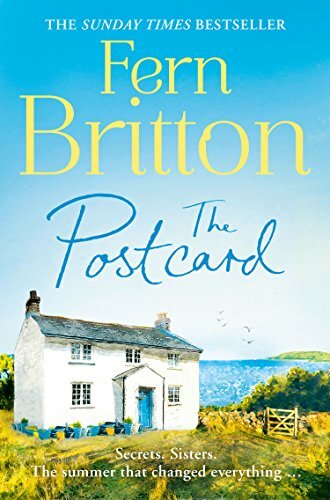 The new witty and warm novel from the Sunday Times best-selling author and TV presenter, Fern Britton.